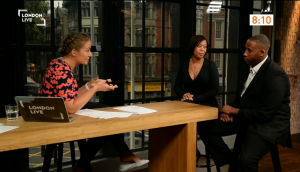 To coincide with the release of the London Assembly Regeneration Committee’s report on the Mayor of London’s Regeneration Fund, last Friday (15th August) representatives from the 639 Enterprise Centre were invited to appear on London’s local channel London Live. Following the riots in 2011, Boris Johnson, Mayor of London announced £70 million of funding towards improvements to the areas of the capital which had been damaged. The 639 Enterprise Centre was one the projects that was born out of the Mayor’s Regeneration Fund after the London Youth Support Trust won a competitive tender to run the building, supporting residents through enterprise, employment and volunteering support. Coverage of the report, Out of the ashes: The Mayor’s Regeneration Fund focused on one key finding; that the fund has not been spent fast enough. Out of the £70 million allocated, £11.4 million has been spent thus far. Nicolette was joined by entrepreneurs Victor Atiemo and Pierre Remy from security firm Secure on Site (SOS), based in the 639 Enterprise Centre. As someone who grew up in the area, Victor spoke of the importance of employing local people and trying to get local people into work – one of the core objectives of the 639 Enterprise Centre.